The word 'Easter" does not come from Ishtar or Astarte! This does not even make linguistic sense since words from those languages do not migrate into English. Quote==This was his attempted etymology of Easter - which is only called that in English of course. The problem is that as the Goddess in question, Eostre is completely unknown otherwise, and Bede was an enthusiast for adopting pagan customs in to Christianity or allowing them to persist where it did not impact on Christian doctrine where possible (out of kindness and a desire to allow people to keep their old ways), so this proposed etymology is probably spurious. In the 19th century a German antiquarian invented Osatra, as the German form, using Bede as his source. Even if eggs were used as a pagan symbol, eggs are originally God's eggs because He created the chickens that lay the eggs. Eggs are part of the created world, created by God. Like the eggs, bunnies are part of God's creation. Even if they have been used as a pagan symbol of fertility by certain groups, the rabbit was originally just a creature made by God and will always be such a creature. Symbols change meaning across time and culture, and many objects and animals have served as symbols for many religions. There is nothing inherently evil with decorating an egg as part of celebrating the resurrection of Jesus, and nothing wrong in pretending the bunny is hiding the eggs (unless you do not like to use these stories, which is a decision by parents) or giving a stuffed bunny to a child. In fact, seeing colored eggs or stuffed bunnies as evil is actually akin to a pagan worldview where objects have inherent secret meanings and/or are animated by spirits. 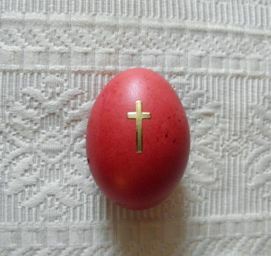 Ironically, those who label Easter eggs and bunnies as evil are reacting in a pagan manner. See the CANA article on symbols. Much of this slandering of Easter traditions is rooted in the works of Alexander Hislop, who has been refuted and debunked. He was wrong! He did not support his statements historically. See CANA article on Alexander Hislop. Hislop's influence has led many into myths and untruths. These untruths, along with websites that preach hate and legalism, have been spread by cults and those who have fallen for these fear-based untruths. FACTS, NOT MYTHS OR FEAR should be our watchword. Let us not believe lies or spread them. For Christians, let us celebrate the risen Christ and use Easter to tell others about the resurrected Savior. "Easter -- Is It Pagan?" By Ralph Woodrow (who repudiated his earlier work, "Babylon Mystery Religion"